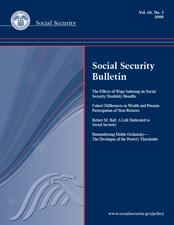 With the death of Robert Myers Ball at age 93 on January 29, 2008, the Social Security program lost one of its most committed supporters. In 2001, Ball's biographer, historian Edward D. Berkowitz, described Ball as "the major non-Congressional player in the history of Social Security in the period between 1950 and the present." In a federal government career that lasted more than four decades, Mollie Orshansky worked for the Children's Bureau, the Department of Agriculture, the Social Security Administration, and other agencies. While working at the Social Security Administration during the 1960s, she developed the poverty thresholds that became the federal government's official statistical measure of poverty; her thresholds remain a major feature of the architecture of American social policy and are widely known internationally.